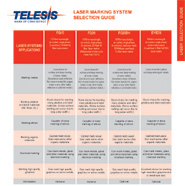 Telesis, the world leader in direct part marking of 2-D codes, offers two different permanent marking system technologies to satisfy a wide range of applications. Pinstamp® Dot Peen Markersprovide an effective but extremely economical solution to many 2-D code DPM (Direct Part Marking) applications on materials as diverse as plastics and hardened steel. Telesis' patented Pinstamp® Marking Technology provides highly accurate dot placement at specific X/Y locations. This process makes Pinstamp® Markers far superior to conventional "oscillating stylus" dot peen markers, especially in 2-D code applications, where accurately marked codes are the key to readability. Telesis Laser Markers are truly "state-of-the-art", producing almost perfectly formed 2-D codes nearly instantly on a wide range of materials, including virtually all plastics and metals. These qualities make Telesis Lasers the perfect choice for applications requiring extremely high throughput or very small 2-D codes. 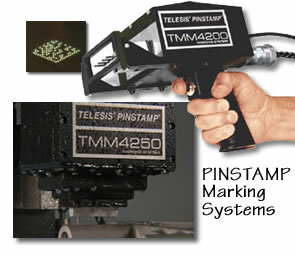 Laser marking systems, including Telesis lasers, normally provide a more precise mark than a Pinstamp® marker, or any other dot peen marker. Since the precision of the mark is an important factor in machine readability, this results in better readability for laser marking in certain applications. Pinstamp® dot peen markers cost considerably less than laser markers. Pinstamp® markers typically cost $8,000-$20,000; laser markers are more commonly priced in the $50,000-$70,000 range. Pinstamp® and all other dot peen markers imprint a round dot; whereas a laser marker is capable of marking a square cell. This adds to the relative readability of laser marks in 2-D applications, since a theoretically perfect Data Matrix® 2-D code is based on square cells. A Pinstamp® marker utilizes much smaller components than a laser marker, making it easier and less costly to integrate. A laser marker is almost always much faster than a Pinstamp® or any other dot peen marker. For instance, the time to imprint a 10x10 2-D code with a Pinstamp® Marker is typically in the range of 2.5 - 5 seconds; with a laser it's more on the order of ½ second. Dot peen marks are widely accepted by the aerospace industry for marking critical parts; laser markers are typically not. The cross-section of a Pinstamp® "crater" (dot) has no sharp corners, only gentle curves, resulting in no significant stress concentration. Laser marking can adversely affect material properties in the heat-affected zone of the mark, which can potentially result in the propagation of cracks in certain materials. Pinstamp® marks are by nature low contrast marks, which depend solely on illumination techniques to create the contrast required for marking. On the other hand, in certain applications, laser marks produce higher contrast, which tends to add to their readability. Reading the code at various times during the manufacture and/or life of the part. Telesis offers a wide range of both Pinstamp® dot peen and a laser marking systems that satisfy a wide range of 2-D code applications. In addition, if offers expert integration of these markers in conjunction with verification and reading equipment offered by a number of manufacturers.